This extraordinary novel is based around a World War Two investigation of a German spy ring in Great Britain, and their link to Black Magic. Though it is accompanied by another investigation, one that involves a potentially fraudulent medium with apparent access to classified information. Cathi Unsworth takes a British WW2 narrative which she develops by embroidering with elegant period detail, as well as an evocative backdrop; which this time adds Witchcraft, Sorcery and Magic to the proceedings. In Unsworth’s historical fiction, the edges between the factual and the fictional are seamless, as is the sense of urgency in the proceedings. It starts in 1943 when a woman’s body is found inside a huge Elm tree on a country estate. Mysterious graffiti is later discovered, which reads “Who put Bella in the Wych Elm?” We have an undercover investigation by police officer Ross Spooner into a German spy ring, which has allegedly been providing information to the Luftwaffe which has led to the bombing of British factories. The rumours of Black Magic and of Sorcerers make the investigation into the Nazi Spy Ring blend the horrors of this world, with that of the Supernatural. We see the (real life) medium Helen Duncan, now suspected of having obtained classified information which she used in a séance in Portsmouth. The efforts to prove the fraudulence (or otherwise) of her revelations is a fascinating part of this book, as are the peripheral characters (many based loosely on real-life people) such as spymaster Maxwell Knight. Detective Ross Spooner travels around Britain in pursuit of the Axis spies but also on the trail of Witchcraft. Being Scottish, with a grandmother who brought him up with folk tales - he is both knowledgeable, and also vulnerable when faced with a world of manifestations, illusions and ritual. 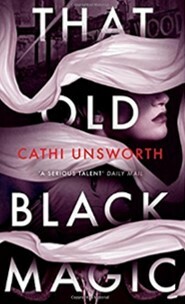 Cathi Unsworth’s narrative runs its course, making the pages etch themselves into the reader’s mind, in a fully immersive experience, as this historical thriller doesn’t require a bookmark – highly recommended.